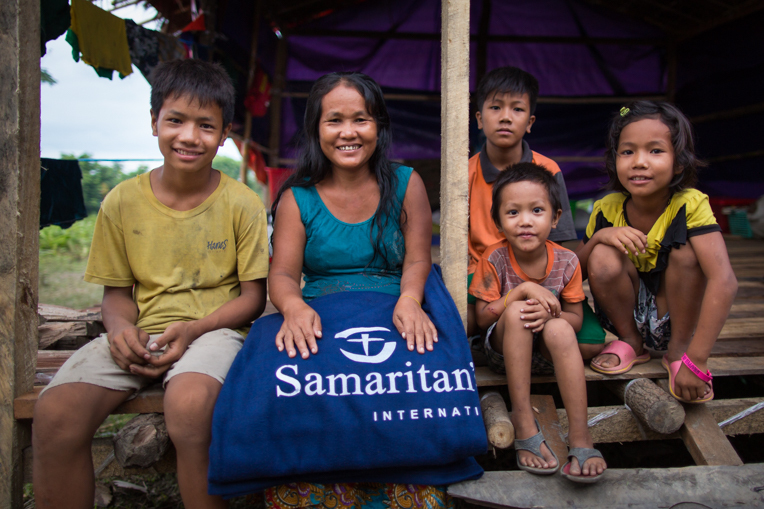 Samaritan’s Purse is partnering with local churches to bring emergency food and the compassion of Christ to remote villages. In the morning heat, they boated out. 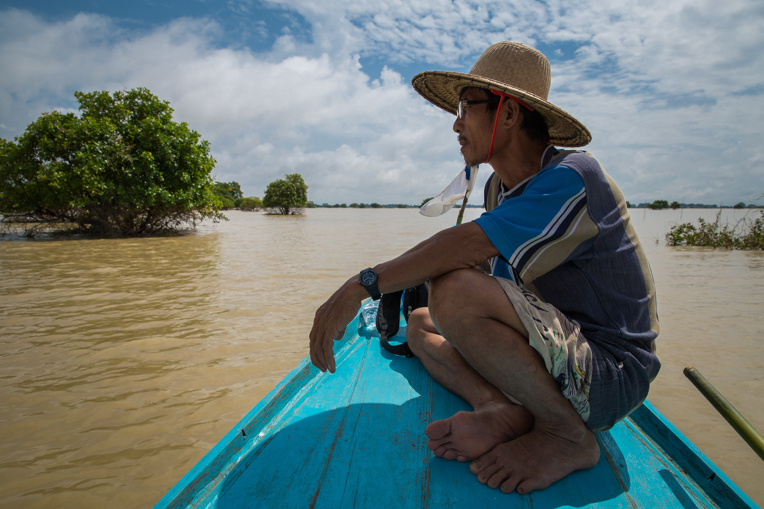 Pastor Benjamin sat on the bow, looking over the muddy lake toward his village. A small group of local church leaders packed into the hull. Just weeks ago, this lake didn’t exist. The river bordered bright green rice paddies. Rice is life for nearly every family here in the Ayeyarwaddy delta of Myanmar—planting, harvesting, eating, and selling. But life turned upside down this year. The floods have turned bright green rice paddies into muddy lakes. The worst flooding in recent memory destroyed paddies from the north of the country all the way down to the delta. It has been devastating even in areas where some annual flooding is expected. Food is so scarce that people are eating the seeds they had stored for planting. Worse, in some villages the storehouses also flooded. Over 200 families evacuated two hours away to higher ground. “As a leader of this village, I was very worried,” he said. They returned to find the roads turned into waterways and the paddies invisible. The polluted water also affected the fishermen’s livelihoods. The pastor said the disaster has taken a toll, but he finds encouragement reading about the hardships Job overcame in the Bible. In the hull of the long-tail boat, Reverend Mahn Benson leaned against a life jacket. His church, Yangon Baptist, had sent an emergency food supply for Ladi Chaung village the night before, and his team was on the way to assist with the distribution. They are one of the churches partnering with Samaritan’s Purse to bring relief to flood victims. After two hours, the boat pulled up to the village as schoolchildren in their white and green uniforms sang in unison from the recreation building. Markings several feet high on the poles revealed the flood’s height. Each family received a month’s supply of rice and oil to help meet their immediate needs. The distribution began from a bigger blue boat near the center of the village. 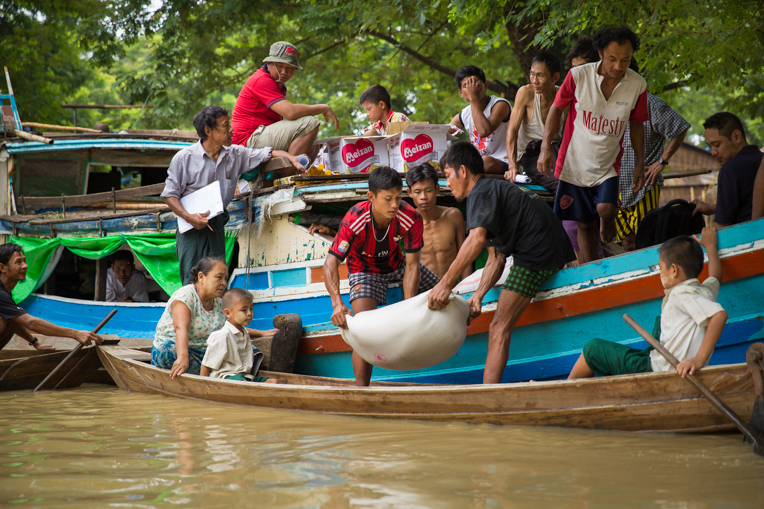 One-by-one, families rowed up to have bags of rice and boxes of oil placed in their canoes. They received a month’s supply to help meet immediate needs as they plan for the future. Just as the distribution came to an end, the daily downpour started. Reverend Benson and his team said their goodbyes and headed out past children peeking around window frames and dangling their feet above the water. In the afternoon rain, they boated back. Pastor Benjamin again sat at his perch. He has learned firsthand how powerful it can be when the Church works together in times of crisis. Brown trees sagged. Debris rested on top of fences. Carts and latrines were overturned. The only sounds were of birds chirping, water draining from a pipe, and the reverend’s unanswered call. While families in the low-lying delta had water up to their roofs lingering for weeks, here in the hills, villagers experienced flash flooding that rushed in and wiped out vegetation, homes, and bridges. It redirected the paths of rivers. Large portions of the riverbank crumbled into the water, along with the houses built on top. All of the nearly 800 villagers in Nan Chaung were displaced. They moved into nearby towns, sleeping in cramped quarters and cooking meals in one big group. The village leader’s wife, 47-year-old Zung Len, cried as she spoke about trying to take care of their five sons. “I wish to go home as soon as possible. I don’t want to stay here with kids and crowded people. It’s a big problem for me. I wish to go home as soon as possible,” she repeated. Zung is a Christian, along with most of the other villagers. Through her tears, she said she still believed God would bless them. 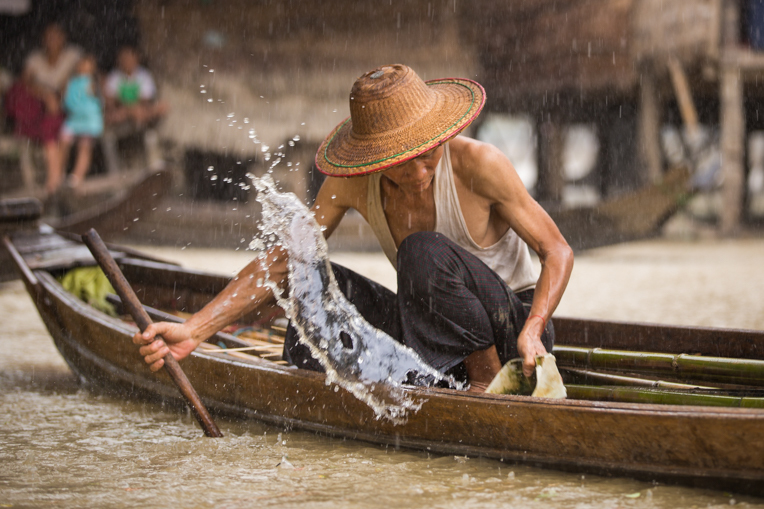 Reverend Sum and his team from the Myanmar Baptist Convention have been working in Chin State to bring emergency food and encouragement to those in need. Where the roads are washed out, they use ox carts to transport the supplies. 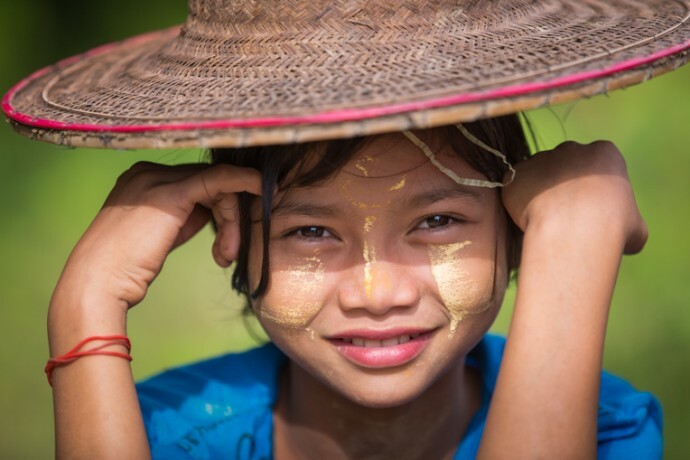 Samaritan’s Purse was one of those partners, and together we have helped provide food for thousands of families, including those from Nan Chaung. 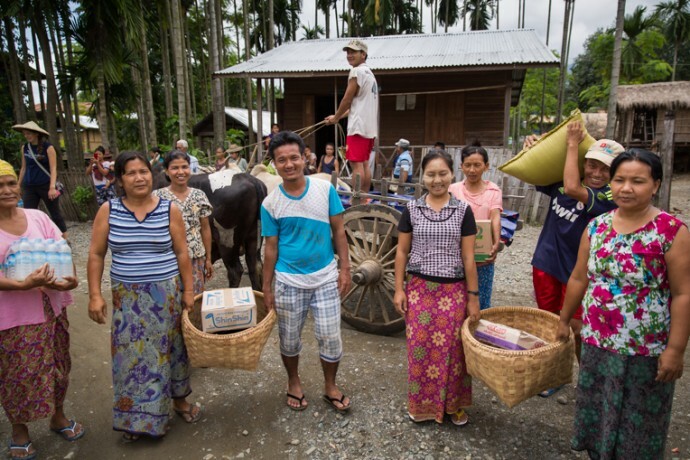 Villagers from Nan Chaung received emergency food supplies from Samaritan’s Purse partner, Myanmar Baptist Church. 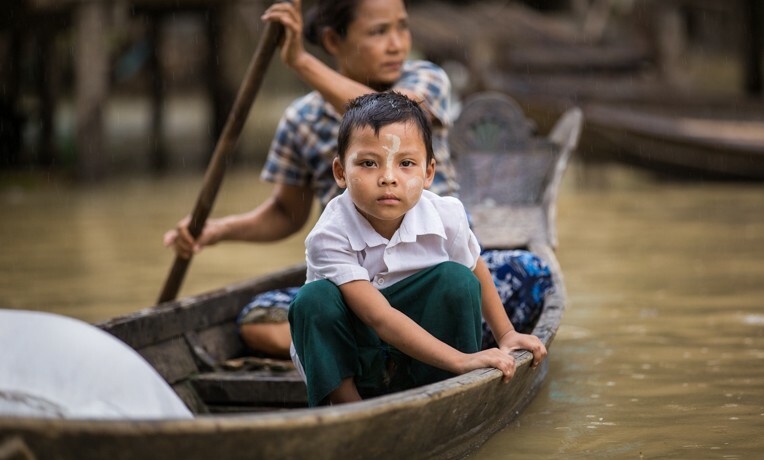 In Myanmar, many religious groups have a habit of only providing aid to their own members. Instead, our partnership is meeting needs for whole communities, whether they are predominately Buddhist, Muslim, Hindu, or Christian. 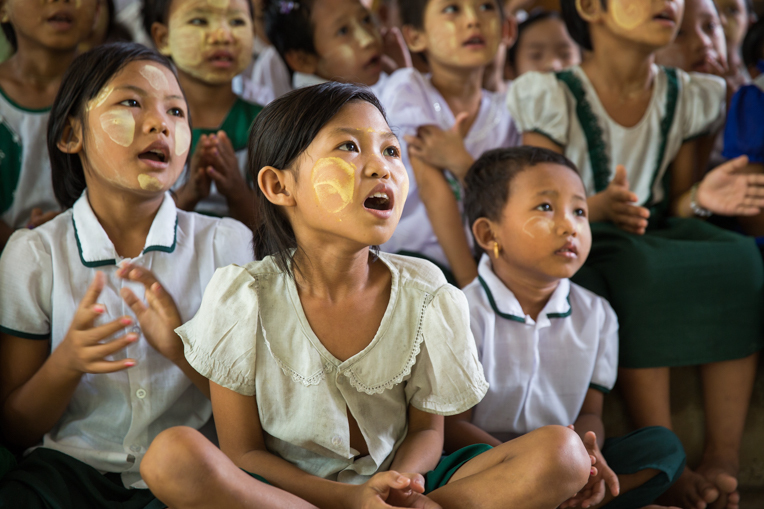 In Rakhine State, a sensitive area that is strongly Buddhist, providing help to all people in need has opened doors for the local church. 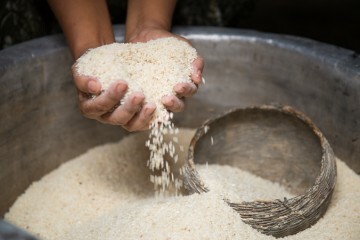 Rice is the livelihood for many families in Myanmar. 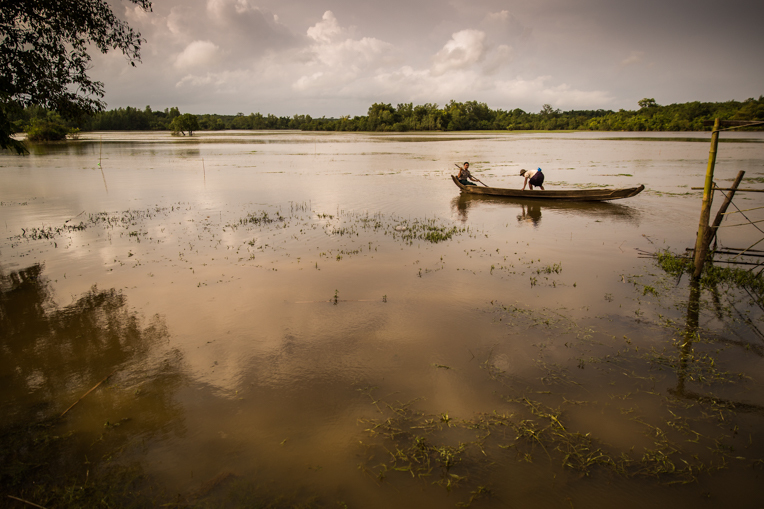 Although Rakhine borders the Bay of Bengal, serious flooding is rare. An 82-year-old resident said she had never experienced a disaster like this in her lifetime. Villagers said they watched boat after boat pass by. None were stopping to help. Then Charity and our partners from Sittwe arrived. Our team saw evidence of this when the villagers allowed us to pray for people in the Buddhist monastery. Providing unconditional help to people in need has opened doors for the local church. She is also encouraged by how the flood response has created opportunities for the local church to bring the hope of Christ into Rakhine. Myanmar Projects Samaritan’s Purse is helping people in rural, impoverished areas of Myanmar. Our maternal and child health program assists young mothers by teaching essential nutrition practices and improving obstetric care. Our teams are working to combat human trafficking through education and prevention programs. Your gift also helps meet desperate needs for water and sanitation projects, and other assistance.